We do board horses for people who want to advance their learning. The basic rate of $700/month includes four private lessons per month. All horses are fed high-quality individualized rations in box stalls at night and are turned out all day (weather permitting). Our two caretakers each have over 80 continuous fulltime years of experience caring for horses. Someone is always on the grounds. We are here to help you develop a lifelong partnership with your horse. 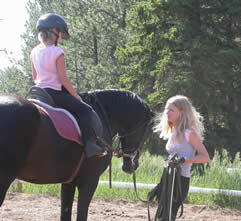 We offer a program whereby adults and mature teens can work in exchange for riding lessons. The first priority is horse turnout and stall cleaning. 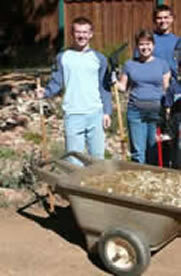 More advanced students can assist with riding lessons and horse training. With over fifteen horses in training and dozens of riding students, there is much to learn! We also have less physical office work and other chores. We host bi-monthly clinics with Fred Kappler, who is himself a consummate student of riding. Fred has been offering clinics at Anchorage Farm continuously since 1996. Clinics are a great time for meeting other students and for socializing. Don’t miss this opportunity! Click here for dates and sign up. Anyone is welcome to watch. It doesn't cost a thing! Join us at lunchtime. All of our students are friendly and welcoming. So is Fred! Centaur Rising hosts Rocky Mountain Dressage Society sanctioned shows each summer. What a great way to see how much you have learned! Everyone is welcome to participate in our shows. Send us an e-mail if you would like to receive more information as these shows get closer. We also attend shows at other locations. For a list of all upcoming events, click here. Want to immerse yourself in learning? Schedule a getaway at your convenience. Optional onsite overnight lodging is available for you and your horse. Don’t miss out! Stay abreast of our news. "Like" us on Facebook at www.Facebook.com/CentaurRising. If you are interested in taking your partnership with horses to a new dimension, join the vibrant supportive learning community of Centaur Rising.